There is a small but significant detail on Achille and Pier Giacomo Castiglioni’s Arco lamp which Konstantin Grcic admires. A hole runs through the solid rectangular marble base, wide enough for a broomstick to fit through such that two people can then use it to lift the stone. It’s a humorous contradiction – the suave and luxurious marble making room for such a humble device to add something to the lamp’s functionality. 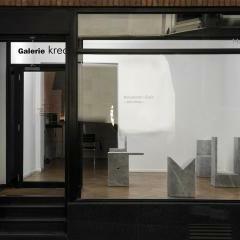 This detail is one that Grcic has applied to the six objects in the new VOLUMES collection for Galerie kreo. 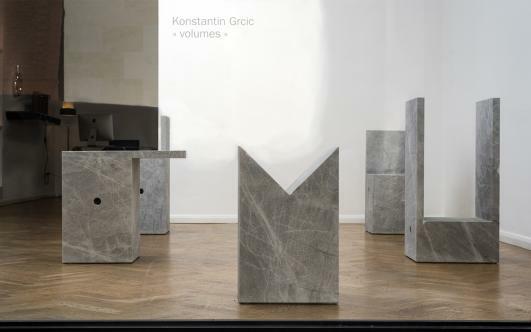 Executed in solid Bleu de Savoie stone, the pieces all have the same circular void cut through their bases. But while Arco is a lamp, VOLUMES has no such straightforward domestic function. 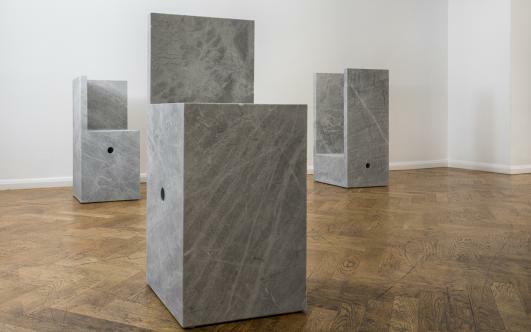 The floor-standing pieces instead remain open-en-ded propositions for speculative uses. While Grcic is well-known for engineering his industrial designs down to the smallest detail, he saw this project as an exercise in simplicity, both in expression and construction. The idea was to create objects that could be made using a singular mate-rial, without added structures or supports – they are sculpted rather than constructed. 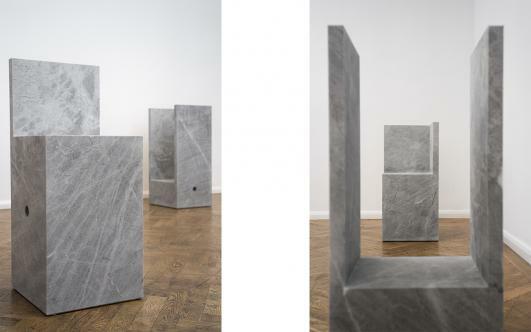 “I instantly thought of these objects as made out of stone,” says Grcic. “As such they are cut away from a solid block rather than built up from different elements and components, which is my normal way of thinking and doing.” However, the execution is more complicated than it might first appear. After each block has been cut into its desired shape, the freshly cut surface has a smooth and unna-tural finish. This is a state that, typically, is emphasised and further polished for domestic use. 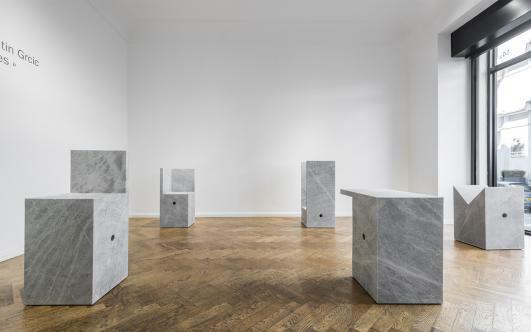 But in a gesture that runs counter to the collection’s domestic intention, the stone surfaces of the VOLUMES objects have been sandblasted, recreating something akin to the stone’s natural and grainy texture. There is an inherent contradiction in this man-made naturalness that is both ap-pealing and mystifying, befitting the question around what these objects are designed to do. hey have six distinct forms, approximately of the same volume as a stool or chair, hinting at their suggested purpose, but not enough to reveal their exact functions. There is a novelty and daring in this non-prescribed use. In that sense, VOLUMES is an experiment in abstraction and one that is quite different to other collections that Grcic has created for Galerie kreo. His first solo show Champions appropriated the branding of sports equipment, applying hand-painted graphics to the metal legs of tables. The second, Man Machine, pushed the func-tion and use of sheet glass, while Hieronymus experimented with the creation of furniture as rooms within rooms. The abstraction of VOLUMES is, therefore, an intriguing turn away from the cerebral and towards the instinctive – towards making objects of uncertain use.